In Which I Discuss Bananas. 'Twas the best of bananas. 'Twas the worst of bananas. 'Twas...bananas!! But really, I have a thing about bananas. They have to be perfect for me to eat them. Perfectly ripe, that is. When they're a bit green, they taste like that. Young, almost-bananas that need a little more life under their belt, and they're just a little weird. Like teenagers. And when they're over-ripe, they're...over-ripe. I think I'll stop the analogy there, or things might get ugly. Anyway. Then there's the nice, perfectly ripe banana, sitting there, looking at me enticingly like a big yellow smile. (Doesn't that sound nice?) That is when I really love bananas, and feel like a sun-tanned native sitting under a palm tree wearing a lei around my neck while I eat one. A banana, not a native. Sorry. 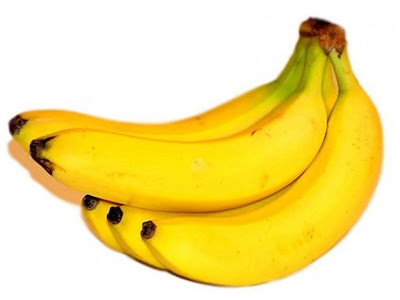 I went through a stage where unless I could eat a banana within that 1-2 day window of perfect ripeness, I simply wouldn't eat it, and my poor forbearing mother was forced to throw out countless bananas that would eventually turn black and spoil. Yick. At that point, who would eat them? Blend until it has reached your desired level of creamy, smooth perfection. Enjoy! I just finished my shake while I was typing the first part of this post. It was very good. But I could still taste the over-ripe banana.